Not only did this one not get away, it waited patiently for me to finish my frolic in the pool then go home and get my camera (it’s not very far), yes a REAL CAMERA, not just a phone. 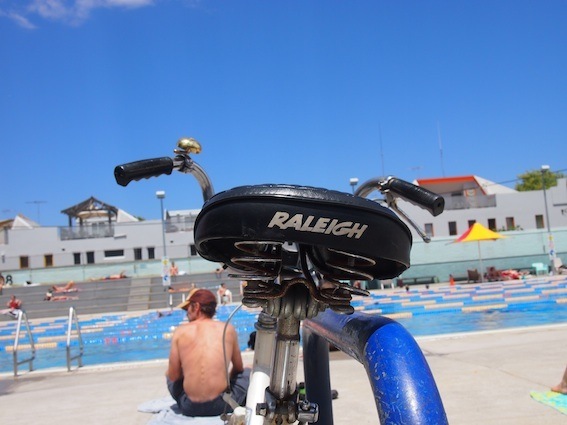 Is it a docu-bike? 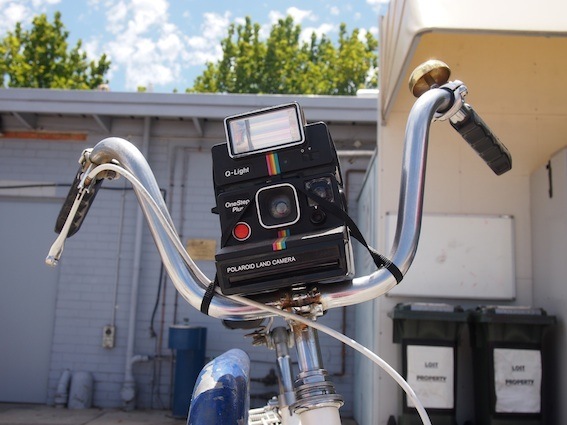 Bike cam? Was it taking photos even as I was splashing around practicing my newly acquired skill of going backwards into an under-water handstand? Sadly the answer is none of the above. I met the rider and she informed me the camera is kaput – only for decoration and a bit of front reflector action. Ah well. Still happy with my find. aha, nothing like a road clearing bell, especially such a pretty one. 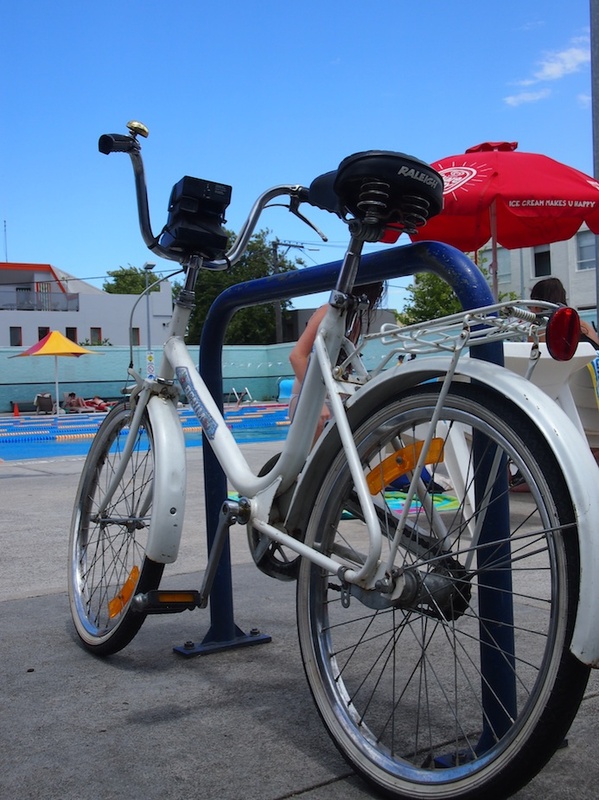 I have two bells on my bike, a small sweet ‘excuse me’ one that I use to notify pedestrians that I am passing on shared paths, and a big ding dong ‘out of my way stupid’ for other occasions, usually not pedestrian related. I don’t know about that. Snap and ride off fast! 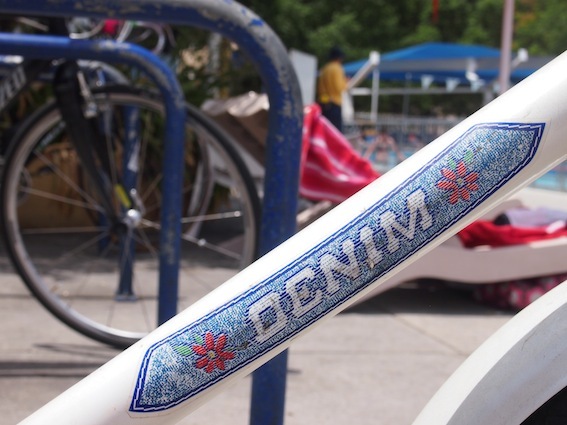 oh yeah, I was thinking more of the bike being parked and the photos just spitting out onto the ground. 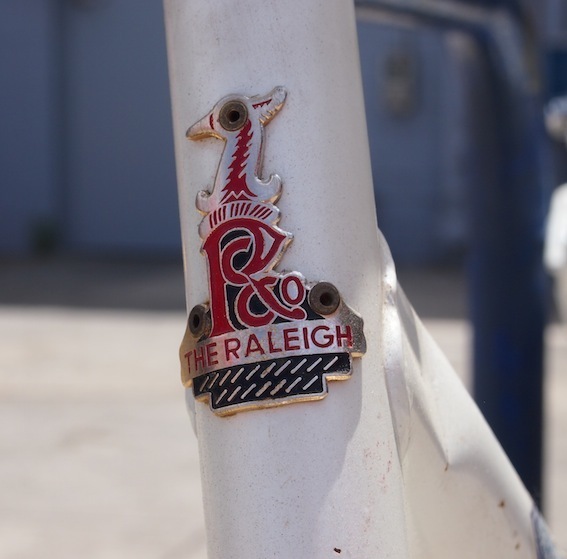 And, the Raleigh head badge without an address (usually “Nottingham, England”, but replaced with “\\\\\\\\ \\\\\\\\\\\\\\\” in this case) means that it was produced either in a foriegn Raleigh factory, or, more likely, by an outsource vendor. Interesting. 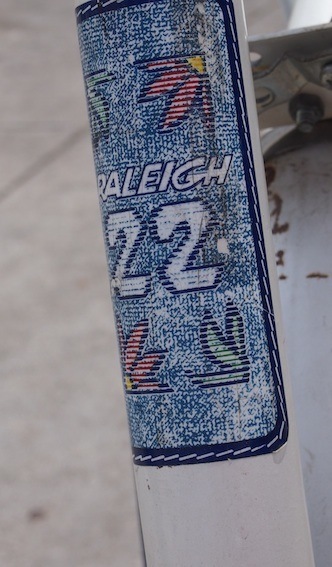 Here in the UK, we normally only get to see vintage Raleighs that were made at Nottingham. Ok that’s it. You are the Official Shopper Bike Guru.